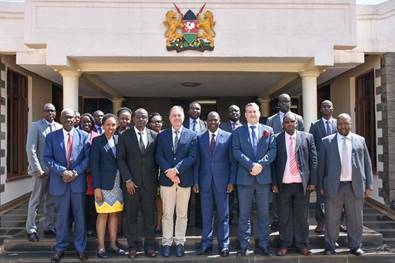 CODATA (CODATA President Prof Barend Mans & CODATA Executive Director Dr. Simon Hodson) on Monday 16 April 2019 had an excellent meeting with Kenya HE VP Williams Ruto and his team on #FAIRdata #OpenScience #OpenData #OpenGovernment. Congratulations all, and to Kenya, in making progress towards promoting Open Data, to benefit all! 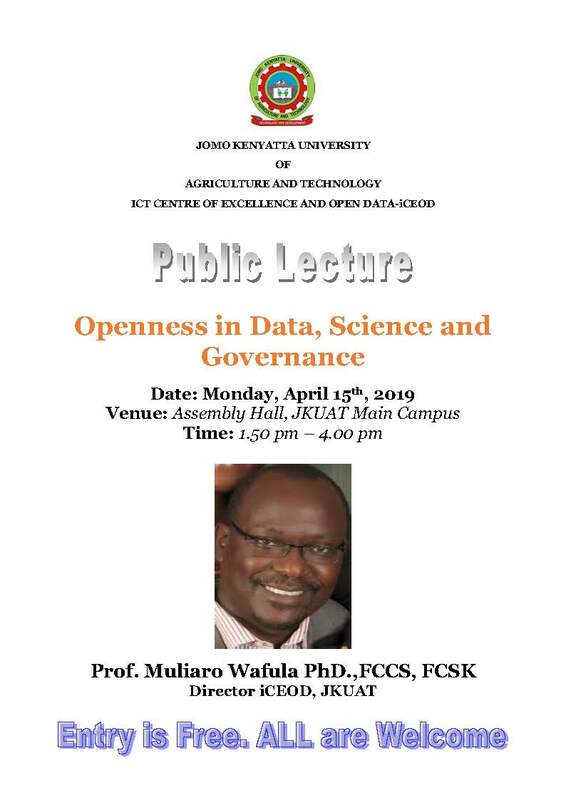 CODATA's Executive Committee member, Professor Muliaro Wafula will be giving a public lecture on 'Openness in Data, Science and Governance' at the Jomo Kenyatta University of Agriculture and Technology. CODATA's President, Barend Mons and CODATA's Executive Director, Simon Hodson will attend this event. Location: Jomo Kenyatta University of Agriculture and Technology, ICT Centre of Excellence and Open Data-iCEOD. The CODATA 2019 Conference will be held on 19-20 September 2019 in Beijing, China. This year’s conference theme is: Towards next-generation data-driven science: policies, practices and platforms. The conference will follow a high-level workshop, 17-18 September 2019, on ‘Implementing Open Research Data Policy and Practice’ that will examine such challenges in China and elsewhere in the light of the emergence of data policies and in particular the China State Council’s Notice on ‘Measures for Managing Scientific Data’. Science globally is being transformed by new digital technologies. At the same time addressing the major global challenges of the age requires the analysis of vast quantities of heterogeneous data from multiple sources. In response, many countries, regions and scientific domains have developed Research Infrastructures to assist with the management, stewardship and analysis. These developments have been stimulated by Open Science policies and practices, both those developed by funders and those that have emerged from communities. The FAIR principles and supporting practices seek to accelerate this process and unlock the potential of analysis at scale with machines. This conference provides a significant opportunity to survey and examine these developments from a global perspective. Opportunities and challenges in research infrastructures. Disciplinary technical infrastructure for research data management and data stewardship. The development of Open Science Clouds, Platforms and Commons: a new model for coordination? Institutional research data management and stewardship status, models and challenges. Data management technologies and interoperability between human and technical processes. Data science education and training. Business models for Open Science, FAIR data, research infrastructures and data stewardship. Other technologies and standards feature open data issues. 3. Data driven scientific discovery and decision-making. FAIR data, interoperability and data integration in multi-disciplinary research areas. Data-driven practices in support of the United Nation’s sustainable development goals. Data-driven practices in support of Resilient Cities; biodiversity; climate change adaptation; agriculture; hydrology and other research areas. Sessions: Sessions will be 90 minutes. Two session formats are suggested: 1) papers sessions which may include research papers, practice papers or a mixture of these; 2) lightning talks followed by a structured panel discussion. Paper presentations should be a minimum of 15 minutes; papers sessions should include a maximum of 4-5 papers. Keynote speakers: there will be keynote sessions on the morning of each day. Plenary panel discussion: the conference will close with a Plenary Panel discussion featuring short presentations. Poster session: there will be a poster session on the later afternoon of the first day. Possible venue (TBC): the Friendship Hotel of Beijing. The Friendship Hotel of Beijing is one of the largest garden-style hotels in Asia. Located in the heart of ZhongGuanCun Hi-Tech Zone, the Friendship Hotel neighbours many world famous tourist sites and universities such as Tsinghua and Peking University, the Summer Palace. 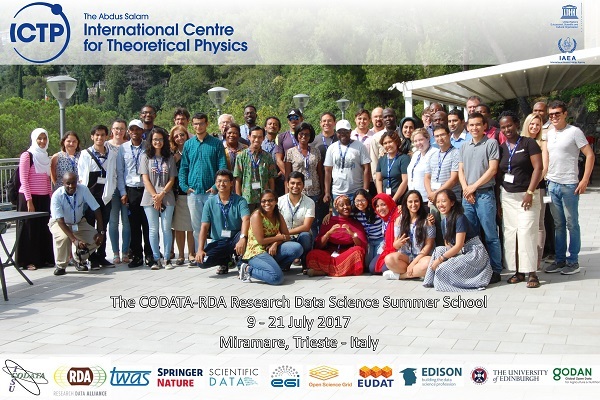 The CODATA-RDA Research Data Science Schools provide Early Career Researchers with the opportunity to meet their colleagues and learn relevant Data Science skills. We actively encourage students to use their learning as an opportunity to create new collaborations and generate new research. 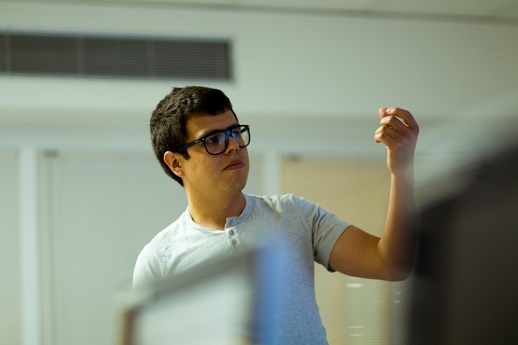 One spectacularly successful example of this is Oscar Arbelaez Echeverry from Colombia who, through links made at the schools, enabled approximately 1.2 million CPU hours [this is akin to having access to a 1600 core cluster for a month] to be run on Monte Carlo simulations. As a result of accessing the Open Science Grid resource, six publications [1-7] have been generated by his supervisor, in the best journals in the field and for wider audiences. By providing Oscar with the relevant skills, he has been instrumental to advancing research in his home institution. England could run short of water within 25 years Sir James Bevan, the Chief Executive of the Environment Agency, recently shared these sentiments at the Waterwise conference in London. Philippines: EU Copernicus programme provides full, free open data to aid in tackling El Niño The drought that is currently sweeping the country as a result of El Niño is already hitting Filipino farmers hard. Protecting the world from the threat of pandemics Creating mathematical and computational models of infectious diseases like pandemic flu gives government and policy-makers a toolkit to respond to an ever-present threat, says the University of Melbourne. The deadline for applications is 12 midnight GMT on Sun 14 April. The Data Science Journal is overseen by CODATA and is a locus for discussions and research around the science of data for the Open Science, FAIR data and Research Data Management communities. It was founded by CODATA in 2002. Since moving to the Ubiquity Press platform and under the direction of Sarah Callaghan, the reach and impact of the Data Science Journal has made considerable progress. The previous Editor-in-Chief, Sarah Callaghan, allocated c.10% or 3-4 hours per week to this role. As is often the case for journal editors, her employer allowed this time (0.1 FTE) as part of her activities. The Editor-in-Chief of the Data Science Journal is an ex officio member of the CODATA Executive Committee and CODATA provides a small fund to support travel and promotion of the journal. The position is not a paid role but an honorarium can be negotiated with excellent candidates for outstanding performance. CODATA would like to warmly congratulate Boniface O. Akuku, Director ICT, Kenya Agricultural & Livestock Research Organization (KALRO), for being awarded the Africa Tech CIO of the Year, during the recent Africa Tech Week event in Cape Town, South Africa (on 5 March 2019). Boniface is one of the co-chairs of the CODATA Agricultural Data Task Group. This is award signifies very well-deserved recognition of Boniface's skills and tireless efforts in managing the KALRO data resources, promoting the availabiity of quality data and information resources for farmers and agricultural scientists. Boniface's work with the Agricultural Data Task Group includes driving the agenda for FAIR agricultural data, developing skills and capacity and engaging stakeholders around data and information services in the East African Region. Indonesia is making progress in integrating flood forecasting into its meteorological early warning system. The group's goal is to show the global statistical community how to combine the latest technologies in order to improve the quality and relevance of official statistics. GeoMesa is an open source suite of tools that enables large-scale geospatial querying and analytics on distributed computing systems. The National Institutes of Health recently issued a Strategic Plan for Data Science, which outlines five broad goals to enhance the biomedical community’s ability to conduct data-intensive science. Underlying these goals is the need to ensure that data and other research outputs are FAIR – Findable, Accessible, Interoperable, and Reusable. As the world’s largest biomedical library and one of the institutes of the NIH, the National Library of Medicine plays a key role in realizing the goals of the Strategic Plan for Data Science. This talk will describe some of the activities at NIH and NLM to increase the FAIRness of biomedical data and other research objects. In addition, this talk explores the impacts of FAIR data by exploring how researchers actually reuse shared datasets. Using over 10,000 requests to use data from three NIH repositories, this study considered who requested datasets and how they intended to reuse them. In addition, the descriptions of the datasets themselves were analyzed to determine characteristics of highly used datasets that could be helpful in determining which datasets will be of high value early in the data life cycle. The findings of this study have implications for FAIR data management – better understanding how data are reused in practice will help ensure that they are managed, curated, and made accessible in ways that will maximize their usefulness to the research community. 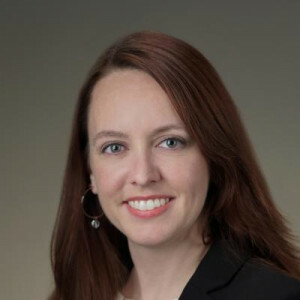 Lisa Federer is the Data Science and Open Science Librarian at the National Library of Medicine, focusing on developing efforts to support workforce development and enhance capacity in the biomedical research community for data science and open science. She serves on the editorial board of the Journal of the Medical Library Association and was the editor of the Medical Library Association Guide to Data Management for Librarians. She holds an MLIS from the University of California-Los Angeles, as well as graduate certificates in data science and data visualization, and is a PhD candidate in information science at the University of Maryland, focusing on biomedical researchers’ data reuse practices and characteristics of datasets that predict high use. Those of us with roles in data management all firmly believe in the FAIR principles. The data arising from publicly funded research should be considered a public good, and the value of that public good can only be realized by the data being FAIR. In some fields of research, where data has been FAIR long before the acronym was invented, there is clear evidence for data re-use and increased research productivity. In many fields, however, the situation is less clear and it is therefore challenging to convince researchers that making their data FAIR is worth the effort. In many cases, as well, the tools and infrastructure needed to automate and sustain FAIRness are lacking, and it is only through making it easy—in fact, the default—to be FAIR that we will be able to confirm our belief that FAIR will both increase productivity and lead to more robust and innovative research. 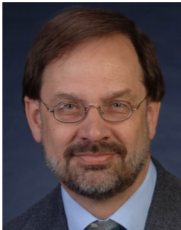 Dr. Robert J. Hanisch is the Director of the Office of Data and Informatics, Material Measurement Laboratory, at the National Institute of Standards and Technology in Gaithersburg, Maryland. He is responsible for improving data management and analysis practices and helping to assure compliance with national directives on open data access. Prior to coming to NIST in 2014, Dr. Hanisch was a Senior Scientist at the Space Telescope Science Institute, Baltimore, Maryland, and was the Director of the US Virtual Astronomical Observatory. For more than twenty-five years Dr. Hanisch led efforts in the astronomy community to improve the accessibility and interoperability of data archives and catalogs. Advanced Workshops will run for their fourth and third year respectively at the International Centre for Theoretical Physics, Trieste, Italy. 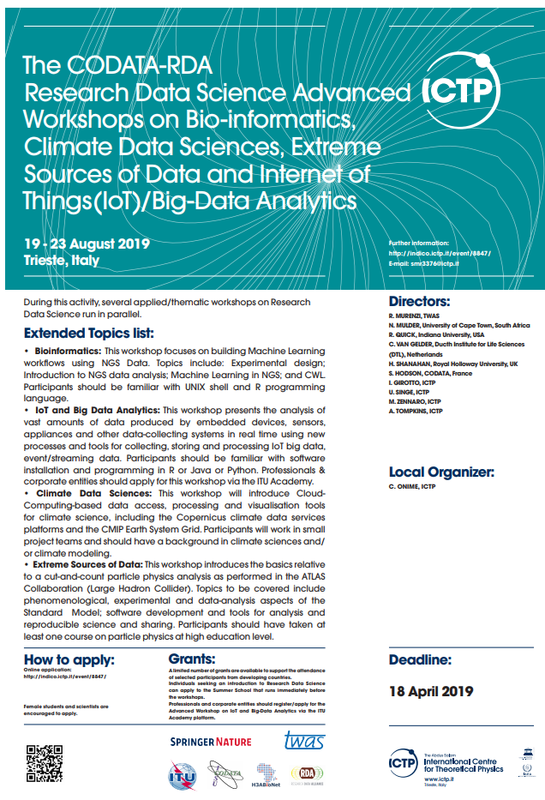 The CODATA-RDA Research Data Science Advanced Workshops will take place on 19-23 August 2019. Apply here! During this activity, several applied/thematic workshops on Research Data Science run in parallel. Bioinformatics: This workshop focuses on building Machine Learning workflows using NGS Data. Topics include: Experimental design; Introduction to NGS data analysis; Machine Learning in NGS; and CWL. Participants should be familiar with UNIX shell and R programming language. IoT and Big Data Analytics: This workshop presents the analysis of vast amounts of data produced by embedded devices, sensors, appliances and other data-collecting systems in real time using new processes and tools for collecting, storing and processing IoT big data, event/streaming data. Participants should be familiar with software installation and programming in R or Java or Python. Professionals & corporate entities should apply for this workshop via the ITU Academy. Climate Data Sciences: This workshop will introduce Cloud-Computing based Data access, processing and visualisation tools for Climate Science, including the Copernicus climate data services platforms and the CMIP Earth System Grid. Participants will work in small project teams and should have a background in Climate Sciences and/or climate modeling. Extreme Sources of Data: This workshop introduces the basics relative to a cut-and-count particle physics analysis as performed in the ATLAS Collaboration (Large Hadron Collider). Topics to be covered include phenomenological, experimental and data-analysis aspects of the Standard Model; software development and tools for analysis and reproducible science and sharing. Participants should have taken at least one course on Particle Physics at High Education level. Individuals seeking an introduction to Research Data Science can apply to the Summer School that runs immediately before the workshops. A limited number of grants are available to support the attendance of selected participants from developing countries.Professionals and corporate entities should register/apply for the Advanced Workshop on IoT and Big-Data Analytics via the ITU Academy platform.